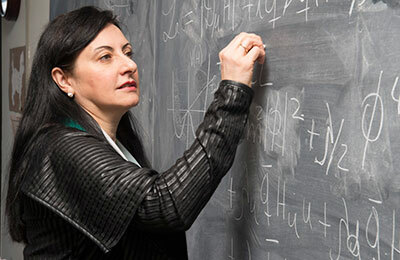 Theoretical physicists work to explain the way nature works at the smallest and largest levels, from the elementary particles that make up everything around us to the forces that influence the structure of entire galaxies. Physicists have discovered much about the way the universe works. Theorists' interpretation and synthesis of experimental results, research into quantum field theory, recognition of symmetries in nature, and invention of new methods of calculation and simulation were all crucial to developing the Standard Model of particle physics. But unexplained phenomena—such as dark energy, neutrino masses, the imbalance between matter and antimatter, and the mass of the Higgs boson—tell us our models are incomplete. Theorists work to expand our current understanding to encompass these mysteries as well. The advancement of particle physics research depends on the partnership between theory and experiment. Theorists guide experiment by creating models for experimentalists to test; they interpret experimentalists' findings; and they look at the big picture to figure out how the principles of nature work together. In the coming years, Fermilab theorists will play an important role in interpreting new studies of the properties of the Higgs boson, neutrinos, dark matter and dark energy. They will develop new techniques for creating simulations and performing calculations essential for understanding experiments at colliders such as the Large Hadron Collider. And they will continue to build new models to drive experiments seeking answers to the remaining mysteries of particle physics.